An unmanned Japanese rocket carrying more than five tons of space station hardware, scientific gear and crew supplies vaulted away from its scenic seaside launch stand in southern Japan Friday (U.S. time) and set off on weeklong flight to the International Space Station. The powerful H-2B rocket's two hydrogen-fueled first stage engines roared to life as the countdown ticked to zero, followed a few seconds later by ignition of four strap-on solid-fuel boosters at 10:06:18 p.m. EDT (11:06 a.m. Saturday local time), roughly the moment Earth's rotation carried the launch pad into the plane of the space station's orbit. Trailing a plume of fire and a billowing cloud of exhaust, the 186-foot-tall H-2B smoothly climbed skyward through rainy weather and quickly disappeared into a deck of low clouds, arcing out over the Pacific Ocean on a southeasterly trajectory tilted 51.6 degrees to the equator. Flight controllers said the strap-on boosters burned out and fell away in pairs as planned about two minutes after liftoff, followed four minutes later by the first stage. The second stage then ignited and continued the push to orbit. There were no apparent problems and 15 minutes after liftoff from launch pad No. 2 at the Tanegashima Space Center, the HTV-3 cargo ship, nicknamed Kounotori, or "white stork," was released into its planned preliminary orbit with a low point, or perigee, of about 124 miles and an apogee, or high point, of around 186 miles. "The flight of the HTV-3 went true and as expected," said Josh Byerly, NASA's mission control commentator in Houston. "Everything now set up for the arrival of the HTV-3 coming up next week." If all goes well, the 17.5-ton spacecraft will carry out a series of carefully orchestrated rocket firings to catch up with the space station next Friday, pulling to within about 30 feet and then stationkeeping while astronaut Joseph Acaba, operating the station's robot arm, locks onto a grapple fixture. Japanese flight engineer Akihiko Hoshide then plans to take over, moving the HTV-3 spacecraft to the Earth-facing port of the station's forward Harmony module where it will be locked into place with a common berthing mechanism. Hatches will be opened the next day. Developed by the Japan Aerospace Exploration Agency, or JAXA, as a contribution to the space station program, the HTV is 32 feet long and 14.4 feet wide. It is designed to carry both pressurized and unpressurized cargo, including equipment too big to pass through the space station's hatches. For it's third flight, the HTV is loaded with 3.9 tons of pressurized cargo, including an aquatic habitat, five small "CubeSats" and a satellite launcher, a catalytic reactor for the station's water processing system and a water pump. Also on board: Japanese food, beverages and crew clothing. The high-tech aquarium can be used to house small fish for up to 90 days. "As a result, aquatic breeding over three generations, from fish parents to grandkids, previously impossible in space shuttle experiments, has become a reality," NASA said in a press kit. "This allows, for example, viewing of the birth of space aquatic creatures that have never experienced the gravity force of Earth, and helps us understand how the space environment affects animals beyond generations in preparation for potential long-term space travel in future." The five CubeSats and their deployment mechanism will be placed in an airlock at the far end of the Kibo lab module. The pallet will be extended into open space and the lab's Japanese robot arm -- a smaller version of the Canadian arm used for station assembly and maintenance -- will be used to properly position the satellites for release. The idea is to perfect the technology needed to launch small satellites from the space station without requiring a spacewalk. The HTV is carrying another 1.2 tons of gear in its unpressurized section, including experimental NASA communications hardware and a common housing carrying instruments and sensors that will be mounted outside the Japanese Kibo lab module. Those experiments include a visible and infrared spectral imager, a sensor to characterize lightning and enigmatic "sprites" in the upper atmosphere and an off-the-shelf high-definition TV camera. The HTV is also carrying two recorders designed to capture data on how the spacecraft breaks apart when it falls back into the atmosphere in September. "The objective of data acquisition is, by specifying the breakup phenomenon of a spacecraft during re-entry, to narrow the splashdown warning areas based on improved prediction accuracy for the rocket’s fall and to gather data that is useful for designing the heating rates of future re-entry vehicles," NASA said in its press kit. The HTV-3 launch and berthing are sandwiched between multiple operations involving Russian Progress supply ships. On Sunday, the Progress M-15M spacecraft will be undocked for tests of a new rendezvous antenna, moving away to a distance of 100 miles before beginning an autonomous re-rendezvous and docking at the Pirs module. If the test goes well, Russian engineers may be able to replace multiple antennas on future spacecraft and improve rendezvous efficiency. The M-15M re-docking is planned for Monday night U.S. time. Three days after the HTV-3 is captured, the Progress M-15M will be jettisoned for good, clearing the way for launch of another Progress, loaded with a fresh load of supplies, on Aug. 1. In yet another test, the Progress M-16M spacecraft is scheduled to dock at the Pirs module four orbits after launch instead of the usual 34 orbit rendezvous, which takes two days to complete. Russian flight controllers are evaluating the possibility of using the launch-day docking procedure for crews aboard Soyuz ferry craft, sparing them two days cooped up in the cramped capsules. Following the Progress operations, two spacewalks are planned, one by Padalka and Malenchenko around Aug. 16 and a NASA excursion by Williams and Hoshide on Aug. 30. 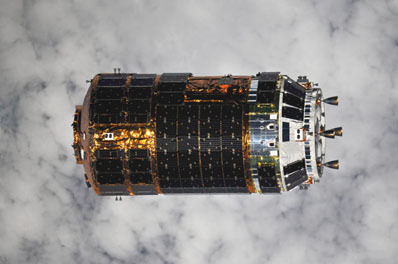 The HTV-3 spacecraft will remain berthed until Sept. 6 when it will be detached for re-entry.